Pre-Paid Gratuities on Luxury Cruises! Select luxury cruise lines, such as Azamara Club Cruises, Crystal Cruises, Regent Seven Seas Cruises, and Silversea Cruises, automatically offer pre-paid gratuities. On those that don't, we're often able to provide Pre-Paid Gratuities for the first two guests in each stateroom (based on meeting a certain price requirement). Luxury Cruise Onboard Credit Sale! Book a luxury cruise and get a substantial Onboard Credit from us! The value of the Onboard Credit depends on the cost of your per person cruise rate, and will be detailed in the "special offer" section while you're pricing out your luxury cruise. Huge Discounts on Luxury Cruises! Book a luxury cruise with us and you'll get the best deal possible, regardless of the ship or sail date! 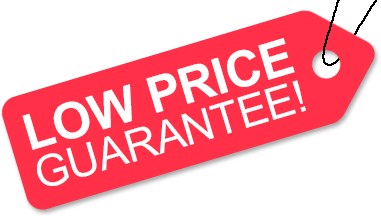 Because of our huge price discounts and "Low Price Guarantee," nobody beats our luxury cruise deals. Plus, select luxury cruises get an onboard credit in addition to the cruise discount! Pay with an American Express® for Additional Savings! Book select luxury cruises with us using your American Express Platinum or Centurion card for all of the payments, and you may be eligible for additional amenities! View our American Express Cruise page for details. Our special offers may not be combinable. Applicable cruise lines for each sale are listed in the promotional boxes above. There are quite a few cruise lines that are considered luxury cruise lines, some offering all-suite and/or all-balcony ships while others offer more intimate "mega yachts" or river cruise ships. Luxury cruise lines provide a fantastic value to those looking for a luxury vacation, and often offer unique itineraries and shore excursions. Exclusive amenities, premium accommodations, spacious public spaces, gourmet cuisine and superb service are among the highlights one can count on while on a luxury cruise. There are even a few luxury cruise lines that offer all-inclusive pricing, including pre-paid gratuities and premium beverages (such as soda, wine and spirits) in their pricing! We are proud to offer the best luxury cruise deals deals possible on all luxury cruise lines. Backed by our "Low Price Guarantee," and powered by our team of experienced travel agents, we're sure to exceed your expectations when booking your next luxury cruise! One of the world's leaders in luxury river cruises, AmaWaterways (formerly known as Amadeus Waterways) is an excellent option for the more discerning and experienced travelers. With exquisitely decorated cabins equipped with flat-screen TV and internet access, French Balconies, Sun Deck with walking track, a whirlpool and bicycles to explore on your own, Amadeus’ new ships are among the most state-of-the-art luxury cruise ships sailing throughout the rivers of Europe, Russia and China. ♦ "Best Overall Cruise Line for River Cruising"
♦ "Best Line for Cruise Value (River Cruise)"
♦ "Best Cabin Features & Amenities on a River Cruise Line"
♦ "Best River Cruise Line"
♦ "Overall River Cruise Ship - Silver Winner"
An award-winning river cruise line, Avalon Waterways offers luxury river cruises throughout the waters of Europe, China, the Galapagos Islands and Egypt. Their ships are among the youngest and most innovative in the river cruising industry, featuring large and luxurious accommodations, fantastic cuisine and wonderful itineraries. As a part of the Globus family of brands, many of Avalon's luxury cruises can be combined with a Globus land package, creating a truly unique vacation package. Thanks to Avalon Waterways' relationship with Globus, they're able to offer inspired enrichment on their river cruises, through guided sightseeing tours, daily port lectures and VIP access into key destinations. 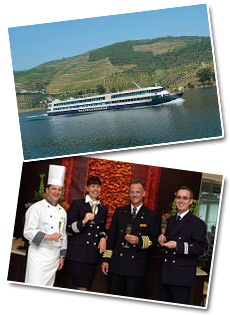 ♦ "Gold Winner - Best Overall River Cruising"
♦ "Top 10 Small Ship Cruise Line"
» Call us for pricing & availability! Azamara Club Cruises is a luxury cruising experience that's geared towards discerning travelers yearning to travel, in luxury, to exotic and rare vacation destinations. On an Azamara Club cruise you'll experience extremely high levels of service, gourmet cuisine, and fantastic accommodations. With a country club casual dress code and open dining format, this luxury cruise product is a fabulous choice for many travelers. ♦ "Best Medium-Ship Cruise Line"
♦ "Cruise Line with the Highest Client Satisfaction (less than 1,100 passengers)"
♦ "Best Cruise Line for Expedition Cruising"
Crystal Cruises is among the leaders in ultra-luxury cruises. Their two all-inclusive ships, Crystal Serenity and Crystal Symphony, are magnificent vessels that are sure to please even the most discerning and experienced travelers. Your days and nights on a Crystal cruise are effortless and carefree, as Crystal boasts one of the best crew-to-guest ratios (better than 1:2) at sea. You will revel in a wealth of time, a luxurious sense of leisure and ease; your hours are your own, to spend as you see fit on Crystal's luxury cruises. ♦ "Best Cruise Ships in the World, medium-sized category"
♦ "Best Ocean Cruise Line"
♦ "Best Large-Ship Cruise Line"
♦ "Best Midsize-Ship Cruise Line"
♦ "World's Best Large-Ship Cruise Line"
♦ "Best Luxury Cruise Line"
♦ "Best Luxury Line for Luxury Ocean Cruises"
Cunard's glorious ocean liners are floating palaces of art deco splendor and Edwardian excess, surrounding guests with every comfort and luxury. They are the quintessence of luxury travel. With Cunard, the journey may be even more magnificent that the destination. There are currently three vessels in the Cunard luxury cruise ship fleet: Queen Mary 2, Queen Victoria and the new Queen Elizabeth. Regardless of which one you choose, you're going to be on a luxurious vessel with fabulous food, entertainment & service. ♦ "Best Health and Wellness Program on a Cruise Line"
♦ "Favourite Luxury Cruise Line"
♦ "Top: Overall Rating, Service, Rooms, Dining & Facilities"
♦ "Best Onboard Educational Programme; Best World Itineraries; Best Transatlantic Itineraries"
Formed in 2002 by luxury cruise industry veterans Joe Watters and Frank Del Rio, Oceania Cruises is one of the world's most popular luxury cruise lines. The finest cuisine at sea, award-winning itineraries and outstanding value define Oceania Cruises' five-star product and have positioned the company as the luxury cruise line of choice for travelers seeking a truly refined and casually elegant travel experience. ♦ "Top 10 Large-Ship Cruise Lines"
♦ "Best South America Itineraries"
Paul Gauguin Cruises offers luxury cruises in Tahiti, French Polynesia and South Pacific year-round aboard their sole vessel, the award-winning m/s Paul Gauguin. Attentive service, all-inclusive pricing, gourmet cuisine and fantastic itineraries are all features that you can count on while on a Paul Gauguin cruise. Since its 1998 debut, m/s Paul Gauguin has been the longest continually operating year-round luxury cruise ship in the South Pacific, offering high levels of luxury, quality, service, staffing and value. ♦ "Top 3 Small Luxury Cruise Ship"
♦ "Highest Ranked Small Luxury Cruise Ship"
♦ "Top 80 Cruise Ships in the World"
♦ "Best South Pacific Itinerary"
The three small to mid-size ships in Regent Seven Seas' award-winning six-star luxury cruise fleet include: the intimate all-suite 490-guest Seven Seas Navigator; as well as the all-suite, all balcony 700-guest sister ships, Seven Seas Mariner and Seven Seas Voyager. Regardless of which ship you choose, you're going to be on a luxurious cruise ship that's staffed with an ultra-attentive staff and a gourmet all-inclusive setup, in which gratuities as well as select wines and spirits are conveniently included! ♦ "Best Mid-Size Cruise Line"
♦ "Top 10 Ultra-Luxury Cruise Accommodations"
♦ "Favorite Cruise Line for Honeymooners"
♦ "World's Leading Luxury Cruise Line"
♦ "Best Small-Ship Cruise Line"
Seabourn Cruise Line is one of the world's most celebrated luxury cruise lines. In the decade since its founding, the line's ultra-luxury ships have consistently ranked among the very best vacation experiences in surveys, polls and the annual honors lists of international guidebooks and travel critics. New for Seabourn will be the 40,350-ton Seabourn Encore (their largest ship yet), set to debut in December 2016. ♦ "Best Small Ship - Seabourn Odyssey"
♦ "World's Best Small-Ship Cruise Line"
♦ "Top Cruise Line Service - Highest Rating"
♦ "Top Cruise Line Food - Highest Rating"
♦ "World's Best Small-Ship Line"
♦ "International Five Star Diamond Award"
SeaDream Yacht Club is an innovative yachting company. Their two sleek and rakish SeaDream yachts are highly acclaimed by discerning travelers seeking a unique seagoing experience and by travel industry observers everywhere. 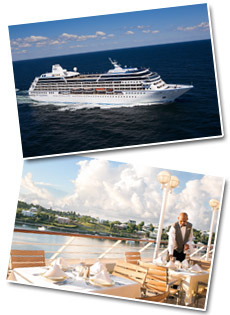 The luxury cruises available through SeaDream Yacht Club is different from big ship cruising. Unlike typical cruises, you'll be pampered by SeaDream's award-winning service and cuisine. You can be as active or as relaxed as you want to be while experiencing the ultimate in luxury, privacy and personalization. ♦ "Best Small Ships (under 200 passengers)"
♦ "Five Stars Club. Exclusive - Above Luxury"
♦ "Top Line for Service"
♦ "World's Best Small Cruise Ships"
Silversea's all-inclusive ultra luxury cruises appeal to discriminating travelers accustomed to plush accommodations and attentive, individual service. Distinguished by its award-winning all-suite luxury cruise ships and impeccable service, Silversea's all-inclusive fares include round-trip airfare (from select gateways), pre-cruise deluxe hotel stay, all beverages including select wines and spirits, gratuities, transfers, and a special shoreside event, The Silversea Experience, on select sailings. ♦ "World's Best Small Ship Cruise Line"
♦ "International Star Diamond Award"
♦ "Best Small Cruise Line"
Discover a new age of sailing, where the traditions of the past are combined with the modern comforts and amenities of the present. Star Clippers' tall ships are perfect for luxury cruising in casual elegance. On board you will enjoy a relaxed atmosphere, friendly crew, and international cuisine, all in pampered comfort. If you're a boating enthusiast, you can choose to lend a hand hoisting the sails, you can climb the mast, or you can just lay back and let the crew do all the work. ♦ "The Ultimate in Travel"
♦ "World's Leading Specialist Cruise Operator"
♦ "World's Best Specialist Cruise Company"
♦ "Truth in Travel Award - Small Ships"
Uniworld, one of America's leaders in luxury river cruise/tour programs to Europe, Russia, China and Egypt, offers more itineraries on more rivers aboard more ships than any other travel company. Few luxury river cruise lines even come close to offering the quality and diversity of choices you have with Uniworld. With over 500 departures, more than 40 itineraries, and a great crew-to-guest ratio, there is simply no better way to travel. ♦ "Top Cabins and Top Dining"
♦ "Top 10 Small-Ship Cruise Lines"
♦ "Editor's Pick - Top River Cruise Line"
One of the world's most popular river cruise lines, Viking River Cruises, has started a new ocean cruise line, named Viking Ocean Cruises. They initially launched this brand with a single vessel, the 930-guest Viking Star, which debuted during April of 2015. Guests experience the intimate and immersive vacation experience that Viking River Cruises is already so well known for, along with some really great onboard features (including an infinity pool, theater, Wintergarden, multiple restaurants, lounge with a selection of craft beers, and much more). Two sister ships, Viking Sea and Viking Sky, are to follow with debuts during 2016 (in April and June, respectively). All staterooms aboard a Viking Ocean Cruises ship will have a veranda, allowing guests to enjoy the sights and smells of the open ocean at all times. With a concentration on ports with rich heritages and plenty of local experts to learn from, cruises on Viking Ocean Cruises cater to those yearning to learn as they vacation. ♦ "Best Small Ships List"
♦ "World's Leading River Cruise Operator"
♦ "Top 10 Small-Ship Cruise Line"
Viking River Cruises operates the world's largest fleet of deluxe vessels built specifically for luxury river cruise travel. With over 175 years of heritage in European luxury river cruising, they are among the most knowledgeable companies in the business. More than half a million people have joined Viking on magical, enlightening journeys through these exciting places. Viking showcases Europe, Russia, China and Egypt's numerous rivers, including the Rhine, Main, Moselle, Danube, Elbe, Seine, Nile, Yangtze and Volga. Windstar Cruises was created with the vision to offer an alternative to the typical cruise or resort vacation. The Windstar passenger sees the world with luxurious accommodations, a casual yet elegant atmosphere, and exquisite service and cuisine. Well known for cruising off the beaten path and pampering without pretense, they sail to exotic locales and hidden harbors that larger ships can't access. Windstar Cruises operates 3 sailing yachts throughout Europe, the Caribbean and the Americas, offering a nice variety of luxury cruises throughout the year. ♦ "Most Romantic Cruise Line"
♦ "Most Popular Cruise Line - Small Ship Category"
♦ "#3 for Favorite Cruise Lines for Honeymoons"
♦ "#1 Small/Mid-Ship Cruise Line"
♦ "Cruise Line with the Highest Client Satisfaction"